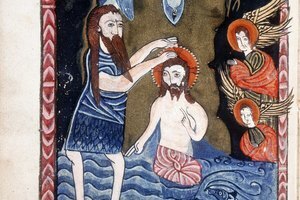 What is Baptism? Who Can Recieve Baptism? The standard definition of baptism is a ritual act done by Christian churches which uses water by immersing or ablutions (cleansing) to admit a new member into a particular church or access to the Kingdom of God. Ablution is the ritual purification of a person by holy water or water that has been blessed. Baptism is valid when performed by a Priest or by any Christian who has been baptized as long as water is used and the Trinitarian formula followed. A baptism ceremony can be performed on anyone of any age who has accepted Christ as their savior. Many orthodox Christian faiths, and Catholics, practice baptizing infants. Older children and adults become baptized when they chose to accept Christ and repent of all their sins. When a person wishes to become baptized they take the request to their churches officiate which can be a priest, preacher or minister. Depending on the church this can be a private matter or a public one in front of a congregation. The Catholic church, which is one of the largest churches in the world, recognizes baptism only when it is done with the Trinitarian formula. This formula was laid out in the biblical text Matthew 28:19 in which Jesus said, "Therefore go and make disciples of all nations, baptizing them in the name of the Father and of the Son and of the Holy Spirit." (King James Version). However, there are some religions who deny the trinity "the father, son and holy spirit" which baptize in the name of Jesus. They use the formula set out in the biblical book of Acts 2:38 where Peter said "Repent, and be baptized every one of you in the name of Jesus Christ for the remission of sins, and ye shall receive the gift of the Holy Ghost"(King James Version). Some of these religions are Unitarians, Branhamists and some factions of Jehovah Witnesses. When infants are baptized the infant is often dressed in a christening gown or outfit (all in white as a symbol of purity) and taken to the churches officiate to be blessed with one of the incantations mentioned above and then the infant is either immersed in the baptismal font or sprinkled with water from it. This proceeding is typically done with the mother and father of the infant as well as the godparents or Christian witnesses present. Godparents are the sponsors of the infant's baptism. A child or an adult who wished to be baptized does not need sponsors but may need a recommendation of church members before a baptism can take place. This all depends upon the church and its requirements. Depending on what church you attend and what religion you are the baptism ceremony may differ. Some churches use running water such as rivers and streams where a full immersion of the body can be achieved as the baptismal sacrament and others use a sprinkling of water upon the head or feet inside a church. The ceremony will often take place after a mass is held in the church with fellow church members present. 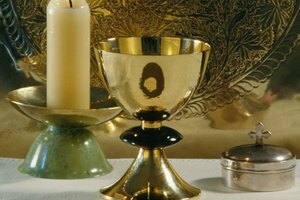 Baptism is consider a sacrament by most churches which is a rite in which God is uniquely active. Jewish rituals have a rite that is called a Mikvah. This practice is a ritual bath for immersion into Judaism. It is comparable to the baptismal ceremonies of Christian faiths and may be where Christians adapted the baptism from. St.Cyr, Linda. "How Does a Baptism Ceremony Go?" 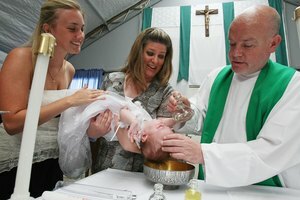 Synonym, https://classroom.synonym.com/how-does-a-baptism-ceremony-go-12078499.html. 29 September 2017.